One single drama—Palace <宫>—brought Yang Mi’s (杨幂) popularity and recognition levels to an all-time high. With dedicated fans from all genders and ages, it is no exaggeration to say that Yang Mi is the most successful Chinese actress of our generation. Yang Mi’s acting may not be the best, but her eye for talent and her ability to cultivate anything into success is definitely worthy of praise. Most of the scripts she has ended taking, such as Eternal Love <三生三世十里桃花>, have become popular successes. She is a major influencer and contributor to China’s current wave of adapting novels to TV and film. Yang Mi is also known for having “poisonous” taste in artists—among the artists signed under her agency, Jaywalk Studio, are Dilireba (迪丽热巴), Li Xirui (李溪苪), and “Faye” Wang Yifei (王一菲), all known for their ethereal beauty. Dilraba Dilmurat, known as Dilireba, is by far the most popular artist currently signed under Yang Mi. The 25-year-old is of Uyghur descent, and has appeared in successful dramas such as Swords of Legends <古剑奇谭>, Eternal Love, and the popular variety show Keep Running <奔跑吧>. Li Xirui debuted as a singer in 2011, but she’s a rising star with the Chinese television scene. 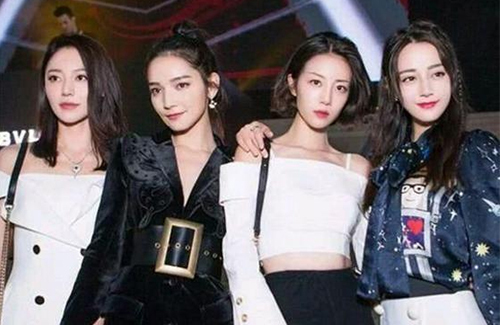 Interestingly, Xirui became known for her beautiful long legs, which is what she shares in common with Dilireba and Yang Mi. Faye is also a force to be reckon with. The 23-year-old made her debut in last year’s Pretty Li Huizhen <漂亮的李慧珍)>, which also starred Dilireba and Li Xirui. Her next project is a supporting appearance in the fantasy drama Heavy Sweetness, Ash-like Frost <香蜜沉沉烬如霜>. Other rising stars include Maggie Huang (黄梦莹), Zhu Xudan (祝绪丹), and Daisy (代斯), the former who made her debut through 2013’s A Clear Midsummer Night <盛夏晚晴天>. I heard Yang Mi screws some of the artists that have signed under her too. I remember Leon Zhang who used to sign under her openly expressed how shady she was and how displeased he was with how she treated him. Hope she does not do it to other artists too.